Your child will grow confident in their creative expression and in their day-to-day life all while giving back to the community! 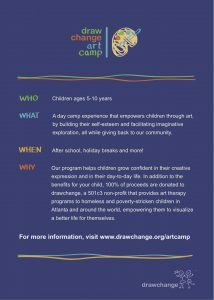 All proceeds will be donated to drawchange, a nonprofit organization that provides art therapy-based programs to homeless children in Atlanta and around the world. All camp sessions will be led by our trusted Art Teachers and all projects are planned around our core competencies: Imagination, Collaboration, Empowerment, Dream-Building, Self-Esteem, Creation and Stress Relief.